The first of four postcards published by the John & Flossie Abston for sale to tourists cryptically depicts the end of a 16,655 mile journey in 1957. Courtesy of Tempe Historic Preservation Office. Really, I need your help. Someone out there must know something about today’s subject – a topic that has been stuck in my brain ever since Tempe Historic Preservation Officer Joe Nucci showed me postcards depicting a very odd couple. I’m even tempted to offer a reward. With the emphasis on tempted. John and Flossie Abston were their names. Anybody heard of them? By all indications the Abston’s lead a non-traditional – one might even say eccentric – lifestyle. How can such an eccentric pair leave no trace of an historical record? No written record of the couple has yet been found. All we know comes from four black & white postcards they published to sell to tourists. 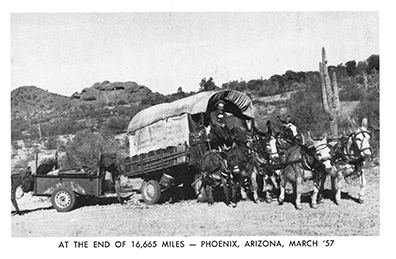 In March 1957 the Abston’s arrived in Phoenix “at the end of 16,665 miles.” That’s 2/3 of the way around the planet. How they accomplished that is not explained. They made their trek in a novel hybrid, mobile residence – a truck bed with wooden sidewalls, topped with canvas stretched over arched ribbing reminiscent of the Conestoga wagons that travelled West in the mid-19th century. But instead of iron-rimmed wagon wheels, this oddity rode on rubber tires. The whole affair was “powered” by four donkeys – two dark ones in the front and a pair of lighter colored ones behind. A stovepipe rose at the front of their “residence”. A pair of side windows was positioned forward. A 50-gallon wooden barrel, possibly for water was placed on a front deck. A vent at the top of the canvas helped air circulate. Accompanying the apparently self-sufficient Abstons were a couple of chickens, goats and sheep. Oh, one other thing. Hand painted in bold lettering across the canvas was the phrase “Remnants of the Old West,” just another mysterious clue to these Bohemian travelers. As best we can tell John and Flossie Abston were a middle-aged couple who tooled around Tempe in their quaint conveyance posing for pictures and selling postcards to tourists. The earliest card, shot in Papago Park, shows a bearded John at the reins of five donkeys. A small metal wagon trails. Another pictures the Abstons standing on the front of the wagon parked alongside a road. A chicken and sheep are perched percariously atop the donkeys. On the third card the Abstons pose beside their donkeys. A large, saguaro cactus towers behind them. The fourth postcard pictures the Abstons “camping” in a grove of cottonwoods. The donkeys are grazing. A couple of chickens peck for food. Flossie sits on a folding chair. And John carries a couple of buckets. So, who were the Abstons? Why this life style? When and how long were they in Tempe? More questions than answers. Someone must have known the Abstons. Now is the chance to step up and do something for your community – help solve the mystery. Please?